A garden filled with deliciously fragrant rose blooms, a pot overflowing with colour or a vase of stunning roses adorning the kitchen bench can’t help but put a smile on your face! Roses are one of the most rewarding flowers to grow. If you want to know how to grow beautiful roses in your home garden, read on! Choose a well drained position with at least six hours a day of full sun. Ideally the position will be protected from strong wind and away from other established trees. Allow plenty of growing room as it can be difficult to prune or pick roses that have been planted close together – there is nothing fun about thorns catching in your clothes as you squeeze between bushes to pick that perfect bloom! TIP: Dig some composted poultry manure into the soil when planting. Super Booster Pellets or Blood & Bone Plus are ideal. It is important to check that you have well draining soil as water logging can encourage disease problems. If water pools and doesn’t drain away, add some organic matter such as composted manure or add drainage or mound the soil before planting. Using a heavily diluted seaweed product such as Neptune Liquid Seaweed can help manage transplant shock and encourage healthy growth. This is a key element to keeping your rose bushes healthy. Water too often and you will have shallow growing roots that are not insulated from the heat or protected from burning. Once you have planted your rose, water deeply two to three times a week until established. The frequency can then be scaled back slightly unless the weather is hot and dry. Potted roses need more frequent watering as the potting mix needs to be kept constantly moist (not wet). TIP: Roses thrive on a deep soaking of around 10 litres per plant. Regular mulching will protect the roots, which is important when the weather is warm and the roots are susceptible to burning. A nice layer of mulch will keep the soil at an even temperature and retain moisture. It is important to keep mulch and grass away from the base of the bush to avoid collar-rot. Poultry manure is a great, nutrient rich fertiliser for Roses. 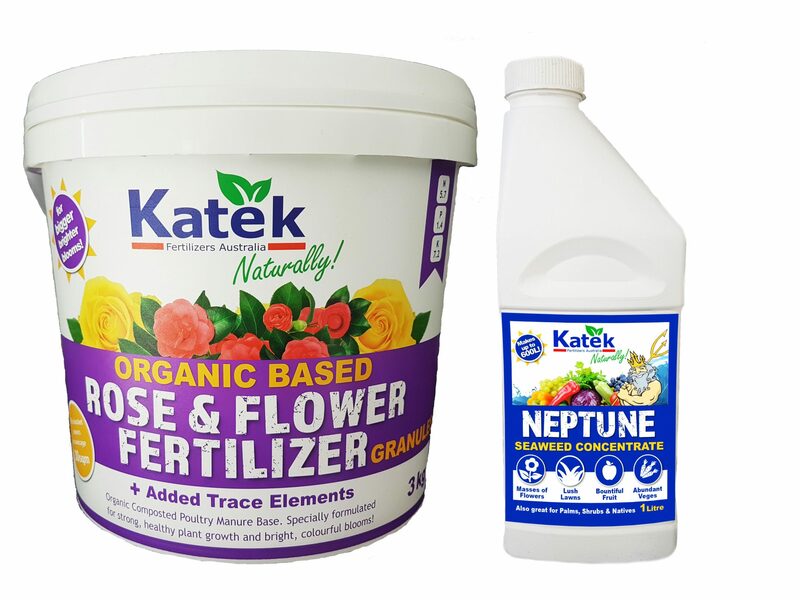 Using a fully composted product like Katek Rose & Flower Fertiliser that is boosted with potassium for enhanced flowering and a range of other nutrients to improve bud to flower conversion and foliage colour. This pelletised fertiliser can be applied every six weeks from Spring to late Summer/early Autumn around the base of the plant. Fortnightly application of a foliar feed like Katek Neptune or Super Growth Liquid during Spring & Summer is also recommended. As seaweed is a great plant health tonic, Neptune can be applied to the soil and foliage helps prevent disease, stimulates the soil’s biology and encourages strong and health plant growth. 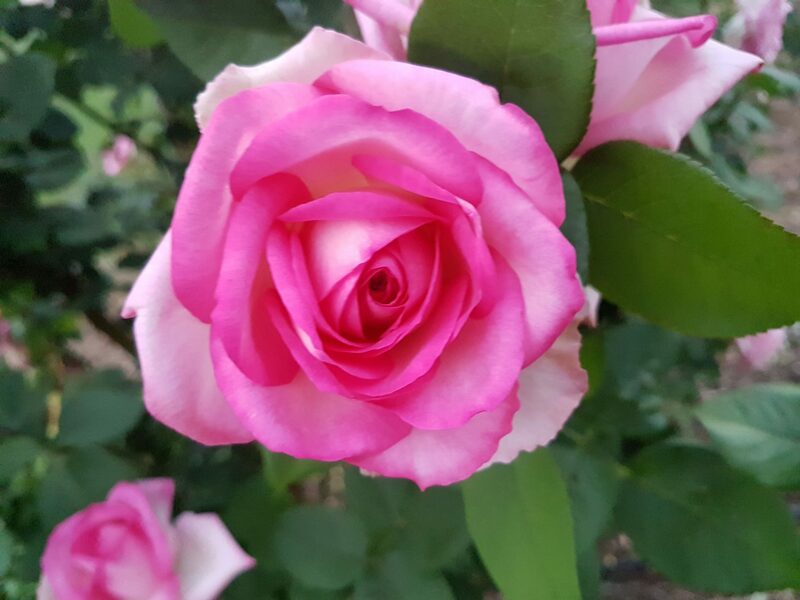 TIP: A fertiliser formulated especially for Roses will contain the nutrients needed for sustained growth, healthy plants and bright colourful blooms. Pruning helps control airflow and the overall health of the plant. The best time to prune is mid to late Winter or at the beginning of Spring. Pruning is important for flower production as the old growth doesn’t produce blooms of the same quality or abundance that new shoots are able to. By removing the older growth the plant can put its energy towards new growth and bigger, brighter blooms. The first step of pruning is removing older branches, dead or diseased wood. When you cut, ensure you are cutting above the growth bud as leaves space for the new leaves to shoot. The general rule of thumb when pruning is to remove 2/3 of the plant’s height in mid to late Winter. During Summer, a light prune back can encourage new growth. To prevent the spread of disease, collect your clippings and burn or dispose of them.